How are you all doing? Where are you? We were well aware of this by this time, but when friends write to you there is more reason to take heed. Tongatapu and Minerva are on a direct line to New Zealand and we didn’t want to stay in Tonga with a possible cyclone coming over and our anchor chain being very close to end of life. So, in the space of two hours, whilst moored to the dock in Pangai, Ha’apai, we decided to ‘split’ and head for NZ sharpish. 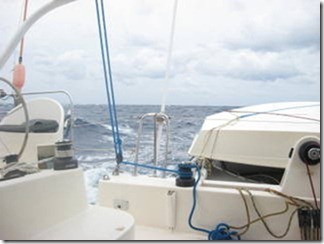 Our friends on s/v Santa Paz and s/v Aquamante had decided to leave at the same time seeing the weather window as narrow, but achievable if we get ahead of it. 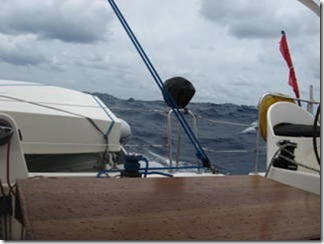 The first 48 hours were lovely really, we got down to the same latitude as Tongatapu and then we picked up speed and covered 212nm in 24 hours which is a record for us.. All the while there was that nagging knowledge that there was a storm coming and we were about to run into it. Even though you have had the GRIB files and sight of a friend’s weather routing you can never tell what’s actually coming and how horrid its going to get. It’s the not knowing that’s the worst. Rough and wet. A horrid passage. Just before it came we lost communication with our SSB, first with the modem for emails and then the voice failed. We were out of touch at that point which made it feel much more isolated. We could hear the radio net a bit in the static and heard of a boat that had turned over and the ensuing rescue 200nm north of us. We had contact with a plane who was looking for them and heard of a yacht, s/v Windogo, that had turned around to go and help them – all very unpleasant to hear. The wind was forward of the beam and got stronger into the night. 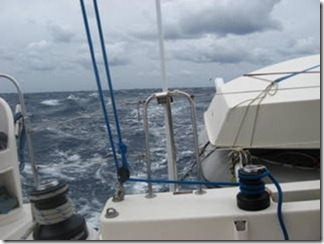 By the time it was dark we had 40kn and a 5-7m sea slamming into us. We headed the boat to windward and settled down to go slowly for the night. It seemed the right thing to do rather than running from it, or heaving to. We made about 1.5kn all night and though it was bouncy we never felt in a real danger. We took water over the boat twice with big seas crashing over the entire boat and filling the cockpit. With our patio door being open at the time we managed to have a cascade through the boat and down into the hulls. What a mess! The last couple of days were closed hauled towards Opua, about 1/3 the way down the North Island of New Zealand, all the while trying to keep ahead of the next front that was due to come across the Tasman sea from Australia to great us. Not comfy, and then we ran out of wind and motor sailed the last day. Now it has got cold as we arrive and we found that during this passage we had put on another layer of clothing for every degree South we travelled. We arrived at Opua fully rugged up with oilskins, boot, hats, fleeces etc. Dubarry boots beware – we bought boots in 2009 for this trip. 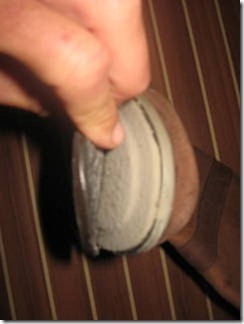 They stayed in a dry locker for 3 years and when we came to use them for the first time sailing from Tonga to New Zealand the soles fell off both pairs. Dubbary dealt with the situation terribly and only after some pushing agreed to accept the boots back to inspect, but we would have to send them to the UK. We managed to do this with friends who were flying, and then had to chase Dubarry about what they had discovered. We were told, that, ‘as a gesture of goodwill’ the store where we had bought the boots would be credited – as if it were our fault the boots had fallen apart. We were never told why the boots failed – my suspicion is that the glue degrades after time in warmth and our boots had been close to tropical sea temperatures of 28-30 degrees C, for about 3 years. Other friends of ours had exactly the same problem with their Dubarry boots this year, but weren’t so lucky getting their money back, as they couldn’t return them to the UK, so they just trashed them, what a waste.